I was honored to be asked to write an article for the American Foreign Service Association’s magazine, whose readership is made up of a prestigious group of Americans whose work has a serious impact around the globe. To all current and former Foreign Service professionals, I thank you for your service and dedication to our country. You are on the front lines in more than 270 U.S. embassies, consulates and various posts around the world. It is safe to say that most Americans do not realize or fully understand the importance of your work in assisting other countries, problem-solving and promoting the United States’ interests around the world—while also improving conditions in the countries in which you serve. As diplomats and development specialists, you understand the role soft power— especially foreign assistance programs— plays in remedying issues and advancing our nation’s interests overseas. When I was first elected to Congress in 2012, I must admit, I was one of those who didn’t fully appreciate the scope of our Foreign Service community. Soon after my arrival on Capitol Hill, I was fortunate to be named a member of the House Foreign Affairs Committee, which provided me the opportunity to learn more about this very important component of our national security apparatus. When I first arrived, it was no secret that I was in favor of eliminating all foreign aid. I had long been skeptical of how U.S. taxpayer dollars were spent overseas, having heard countless stories of America’s generosity being rewarded by wasteful projects and corrupt foreign bureaucrats enriching themselves at the expense of the U.S. taxpayer and robbing their own citizens of those intended benefits. I developed a deeper understanding of how aid could be an important tool in maintaining American leadership while creating strong allies in a complicated and unpredictable world. Evaluating the way our foreign aid is implemented, I noticed there was plenty of room for improvement. It was imperative that we elevate America’s global competitiveness, reform our antiquated programs and bring development finance into the 21st century. That is what led our team to introduce The Better Utilization of Investments Leading to Development (BUILD) Act, which was signed into law last year. I believe this is the most important reform of U.S. foreign development programs in decades. The BUILD Act consolidates various federal development programs and agencies into one full-service, selfsustaining U.S. International Development Finance Corporation. Essentially, the IDFC combines the Overseas Private Investment Corporation and the U.S. Agency for International Development’s Development Credit Authority, while at the same time expanding U.S. development finance capabilities. The BUILD Act has reformed and modernized America’s approach to development finance and made it more efficient and effective. The BUILD Act has reformed and modernized America’s approach to development finance and made it more efficient and effective. U.S. foreign aid and development, when properly implemented, is a potent tool of soft-power diplomacy. As you well know, when used effectively these funds help improve our diplomatic, economic and national security interests around the world. When you combine a modern development finance system with knowledgeable and experienced Foreign Service members such as yourselves, it spreads goodwill and stability to other countries. This goodwill leads to partnerships that help create strong economies, strong trade agreements and strong national security. Thanks to you and your dedication, the future of U.S. foreign policy and the U.S. Foreign Service is looking bright. I cannot wait to hear about how professionals such as yourselves go on to utilize the tools created by the BUILD Act and witness the positive impact you create around the world. 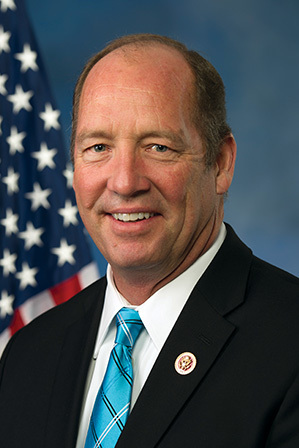 Representative Ted Yoho (R-Fla.) is a member of the House Committee on Foreign Affairs and lead Republican of the HFAC Subcommittee on Asia, the Pacific and Nonproliferation. He is also a member of the Committee on Agriculture.